Bill Truran with his map of Sussex County, and arrowheads he has collected from the area. HARDYSTON – For Sussex County native, Bill Truran, it is about preserving stories that could be lost in time, as well as rescuing relics from our area, and then, passing it on to those who are not aware of the history that comprised Sussex County, or those who would like to learn more. Truran is the author of several published local history books. Arcardia Publishing’s Images of America: Franklin, Hamburg, Ogdensburg and Hardyston was his first, published in 2004. Then, Truran branched out for three on his own. Sparta NJ: Head of the Wallkill A History of Sparta in Images and Words, Mining for America: The Franklin-Sterling Hill, NJ Zinc Mines and The Fluorescent Capital of the World, were his next two books, and Country Lanes: Portrait of a Century Past, a hard cover coffee table style book about the paintings of local artist Louis Larson, was his third. Truran has since done an encore with Arcadia Publishing, releasing the book that is his fifth, Images of America: Sussex and Wantage, in 2012. Truran, who is technically known as Dr. Truran, holds a PhD, and is an engineer at Picatinny Arsenal. Truran has additionally been a professor at Stevens Institute of Technology, and has been involved with various boards and societies relating to his engineering background and his historical interests. Truran also spends his time as a liaison to the United States Military Academy at West Point. Meeting Truran one knows, is truly speaking to an authority on the fine points of Sussex County history, as well as meeting someone who is versed at a curator level on relics relating to our area. “I’m trying to collect things to tell a story,” said Truran. Getting a glimpse of the items that Truran collects, which he often brings to local schools to speak to children about history, is like walking into a Sussex County museum. 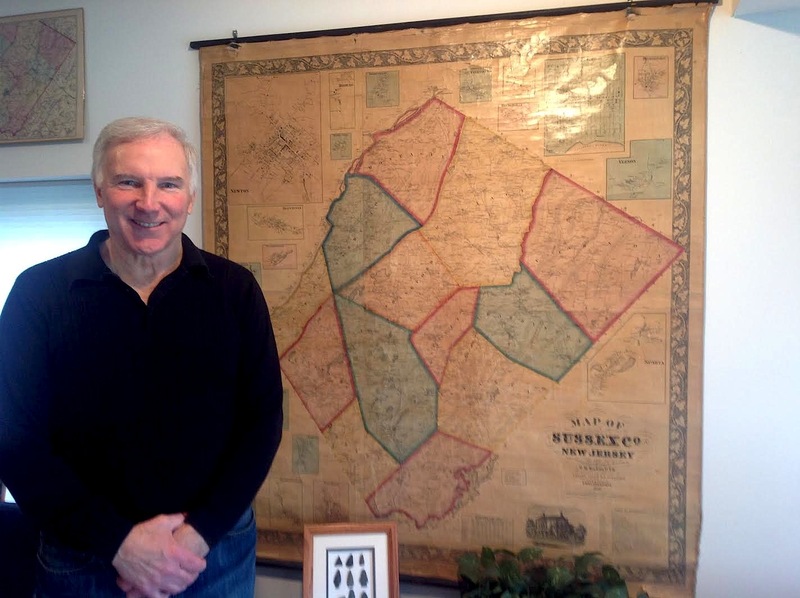 Truran’s private collection encompasses items such as an 1860 Sussex County map, which he purchased at auction, and that hangs on his wall. Another is a clock that had been in the Franklin School, where he attended from kindergarten to 12th grades. Both of his parents were also students at the school, and even his great-uncle. There are other treasures that he has uncovered, literally, which are part of our local history that he has found in more unusual places. One is a stack of books, for example, which was buried in an old chicken coop, behind what is now the Irish Cottage. The books, he said, belonged to students who had been his great-uncle’s classmates, at the Old Franklin School, in 1905. With a family history deeply rooted in Sussex County, it is no wonder that Truran branched out into having an interest in keeping the torch of local history lit. “My grandfather had a bunch of slides and photos,” said Truran, who ended up with them. The slides were meticulously kept, as were the items in the photo album. Truran’s grandfather was in fact, so detailed with his photographs, a photo from a parade in Franklin was classified by a written account from his grandfather. The fine points about the photo, in essence, helped Truran to be able extract important facts, to shed some light on a similar photo at TD Bank in Franklin, which is a colorized view of the parade, and taken two minutes apart from Truran’s grandfather’s photo. Many of Truran’s photos focus around the Franklin mine, where his grandfather was an employee, a mine safety person, and worked at the picking table. With the interest in the mine, Truran also has his own fluorescent minerals, and is versed about the zing and iron mining in the area, as well as Thomas Edison’s involvement in the mining area. He has other accessories from the mining times, such as a carbide lamp, and galvanized bucket. There are paper artifacts he has collected as well – letters, and ledgers from Edison’s time. Information and items surrounding the Old Stone Mill and the Gingerbread Castle in Hamburg are some other items in his collection. The Old Stone Mill near the Wallkill River grew to support a Nabisco institution – Wheatsworth Crackers – hence the name as well of Wheatsworth Road, where the mill once stood and the Gingerbread Castle was built in the 1930’s. Old photographs round out his collection, as well as some paintings from Louis Larson, which originals can sell for up to $50,000 each. “I’ve covered most of the history in the area,” said Truran. His next potential topic is the lore of the area, and the people and places surrounding various stories. “I want to see what kind of an impact our lore has,” Truran said. Truran will be one of several authors at a Local Author Book Signing at the C3 Workplace on 37 Main Street in Sparta, Sat., Dec. 14, from 3 p.m. to 6 p.m., where attendees can purchase the works of local authors, and have their books signed at the event. Authors beside Truran include: Amy Arvary, Donna Price, Laura Kendall, S. Thomas Summers, Ann Freeman Price, Janet Neal, Arlene Rich, Janet Pfeiffer, and Sarah Collins. Click here as well for Truran’s website, where his books can also be purchased. Three of Truran’s books are also currently available on amazon.com, with Images of America: Franklin, Hamburg, Ogdensburg, and Hardyston, also available on Kindle. Click here for his author page on Amazon.com. Click here for Images of America: Sussex and Wantage, on Amazon.com. Stay on the “inside scene” with NJInsideScene.com…and learn about all the great people and happenings in our area! Click here to like our Facebook Page.